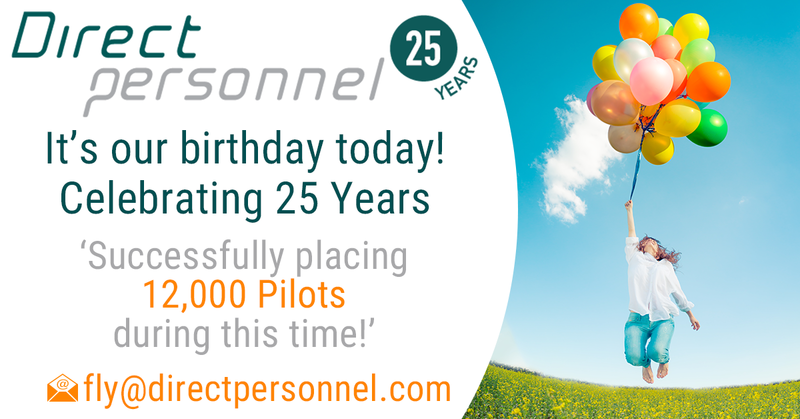 Direct Personnel is celebrating 25 years of successful aviation recruitment. Over the last 25 years, we have accrued extensive knowledge in aviation recruitment, building lifelong relationships with our candidates and business partners. Direct Personnel focus 'perfect match' recruitment, an approach that our candidates and business partners truly value. We are proud of our retention rates. Once a candidate has been successfully placed into a position, they have joined the Direct Personnel family - We are there for all of our Pilots for their entire career, seeking out new opportunities for them when they are ready to make their next move. Join in celebrating our birthday together with us, contact us so that we can extend our family even further!